We’ve brought the tree down from the loft, untangled the lights and decked the halls with boughs of holly. It can only be the season for giving and we have something for all the family…. 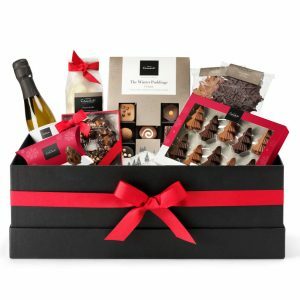 This Hotel Chocolat red ribbon tied hamper contains Winter Puddings H-box, 50% Milk Wreath with Cookies & Caramel, Milk & Caramel Enchanted Forest, Ho Ho Ho – Milk, Salted Caramel Snowflakes, Dark Snowflakes, Coconut & Macadamia Snowballs and Prosecco Superiore DOCG (200ml).